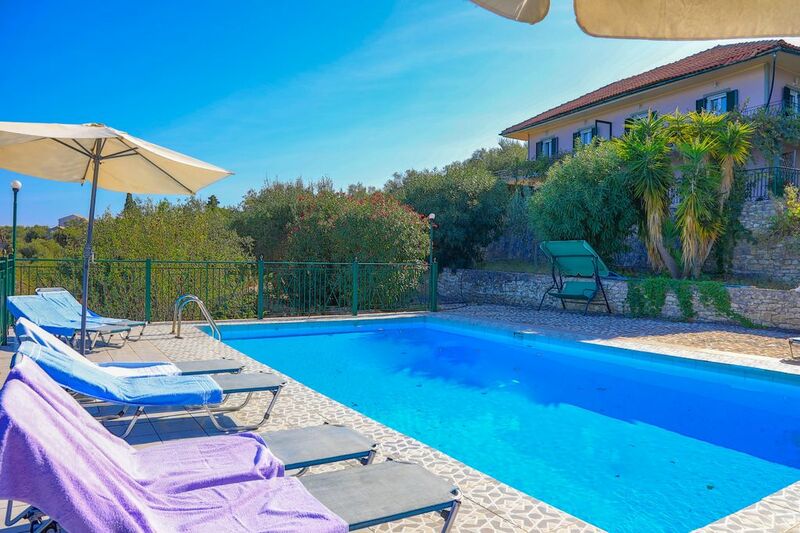 Antigoni villa is a typical Paxos two storey rental property, which boasts three two-bedroom apartments and a private shared pool (10 x 5 m), located on a hillside olive grove in Dendiatika, neighbourhood of Paxos. Antigoni Villa Tria is a beautiful two bedroom Apt, really spacious for a family or party of four persons, located on the ground level of Antigoni Villa, air-conditioned, with front terraces and stunning sea views. At the front of the property is located the large shared pool, in between a beautiful garden and the sea underneath. It enjoys spacious sunny terraces, sun-loungers and umbrellas and it can be reached via a small pathway. &#8211; Parking available for 3 cars(Private). This charming holiday property consists of an open plan living &#8211; dining &#8211; kitchen area (kitchen with cooker, fridge-freezer, twin sinks, kettle, coffee machine and toaster) and it is accessible via a small pathway from the ground private parking space (at the front of the property). Alongside this area is set a family shower room, a twin and a double bedroom with windows overlooking the pool and the open sea. There is an air-conditioning unit stored in the living area and serves both the bedrooms. &#8211; Dendiatika, Loggos, Paxos, Post Code: 49082., GPS: (39.228180, 20.157586). &#8211; Official Check in time is 13:00 hrs. &#8211; Luggage Check in is 13:00 hrs.